A very common, general purpose, input device that allows text (abc…),numbers (123…) and symbols (%$@...) to be entered into a computer. A keyboard is simply a set of buttons. Each button has a symbol assigned..
A small keyboard that only has numbers. 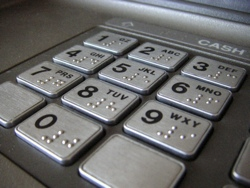 Used to enter numeric data into computers such as those in ATMs. Most computer keyboards have a numeric keypad on the right side, and most mobile phones (there are also computers) have a one for entering phone numbers, etc. 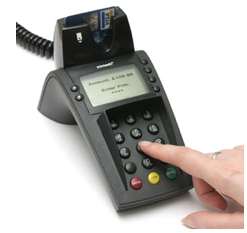 This is a device with a numeric keypad used to enter a person’s Personal Identity Number (PIN) e.g. when paying with a credit card.